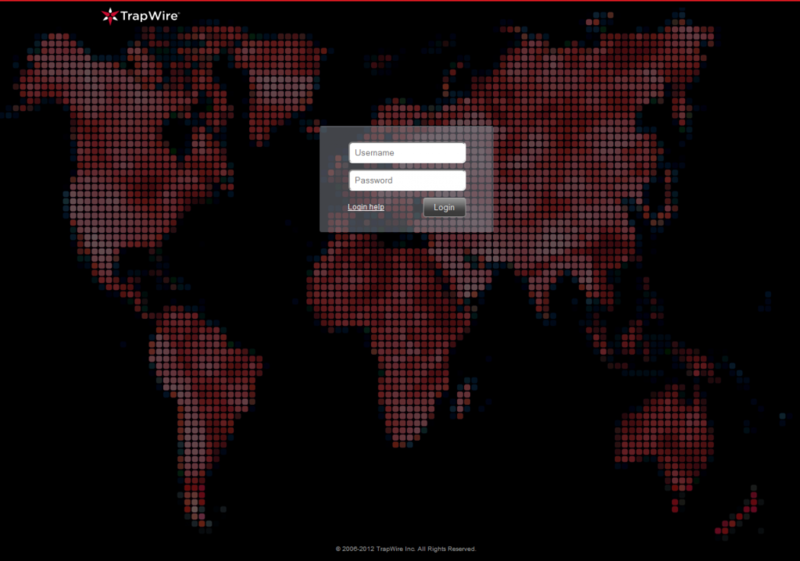 A screenshot from the front page of trapwire.net, which is believed to be a web-based portal affiliated with the TrapWire system. Hacked emails from the private intelligence firm Stratfor shed light on a global suspicious activity surveillance system called TrapWire that is reportedly in use in locations around the world from the London Stock Exchange to the White House. The emails, which were released yesterday by WikiLeaks, provide information on the extent and operations of a system designed to correlate suspicious activity reports and other evidence that may indicate surveillance connected with a potential terrorist attack. Documents submitted with Abraxas’ initial trademarking of TrapWire, describe the system as utilizing “a facility’s existing technologies (such as pan-tilt-zoom [PTZ] cameras) and humans (security personnel, employees, and neighbors)” to collect data which is then “recorded and stored in a standardized format to facilitate data mining, information comparison and information sharing across the network.” TrapWire “standardizes descriptions of potential surveillance activity, such as photographing, measuring and signaling” and then shares “threat information” across the network to track potential correlations across other locations on the network. One thing that makes TrapWire a particularly interesting company is that its president, chief of operations and director of business development are all former employees of the Central Intelligence Agency. According to a management page on TrapWire’s website, which has recently been removed for an undisclosed reason, the president and one of the founders of the company, Dan Botsch, “served 11 years as an Intelligence Officer with the Central Intelligence Agency, focusing on Russian and Eastern European affairs.” Michael Maness, the company’s business development director, served over 20 years with the CIA, “where he directed counterterrorism and security operations in the Middle-East, the Balkans and Europe. As a senior operations officer and field operations manager, he was instrumental in combating Al-Qaeda’s operational units in the immediate wake of the September 11 terrorist attacks.” Michael K. Chang, the company’s director of operations, served for “12 years with the Central Intelligence Agency as a counterterrorism operations officer and security officer” and even acted as personal security for the Director and Deputy Director of Central Intelligence. The Stratfor emails on TrapWire detail the extent to which the software system is being utilized around the world, describing deals with clients representing domestic agencies, foreign governments and multinational corporations. An email from Don Kuykendall, the chairman of Stratfor, in May 2009 describes how TrapWire’s clients “include Scotland Yard, #10 Downing, the White House, and many [multinational corporations].” The email goes on to say how Stratfor is working to help introduce TrapWire to people at “Wal Mart, Dell and other Fred cronies.” Another email from Fred Burton to Kuykendall in July 2011 describes how the Nigerian government is interested in opening a fusion center and may want to deploy TrapWire in the Nigerian Presidential Palace. In another email Burton brags about Stratfor’s role in authoring situation reports that feed into the TrapWire system, saying that this is the Stratfor’s number one way of impressing potential clients in government positions. “Do you know how much a Lockheed Martin would pay to have their logo/feed into the USSS CP? MI5? RCMP? LAPD CT? NYPD CT?” Burton asks, implying that TrapWire is in use by the U.S. Secret Service, the British security service MI5, the Royal Canadian Mounted Police, as well as counterterrorism divisions in both the Los Angeles and New York Police Department. In a 2009 thesis from the Naval Postgraduate School, the Los Angeles Joint Regional Intelligence Center (LA-JRIC), one of more than seventy fusion centers around the country, is listed as utilizing TrapWire. The Information Sharing Environment – Suspicious Activity Reporting Evaluation Environment Report from 2010 describes how the Las Vegas Police Department is providing TrapWire software to at least fourteen different hotels and casinos in the area. Several emails make reference to the network running in Las Vegas and one discusses contacting a security officer at the MGM Grand to discuss the system’s practical implementation. According to one particularly unusual email from Burton, TrapWire is reportedly in use to protect the homes of some former Presidents of the United States. iWatch pulls community member reporting into the TrapWire search engine and compares SARs across the country…with potential matches being fed back to the local LE agency. An amazing amount of good quality reporting is coming in from alert citizens (and police officers) in the DC area in particular. We have regional networks in which information sharing is limited to that network. If a network has 25 sites, those 25 sites match against each other’s reports. They can also send reports to any other site on the network and they can post reports to a network-wide bulletin board. Sites cannot share information across networks. However, we do cross-network matching here at the office. If we see cross-network matches, we will contact each affected site, explain that the individual(s) or vehicle they reported has been seen on another network, and then offer to put the affected sites into direct contact. We have not yet had a cross-network match. I think over time the different networks will begin to unite. I’m not exactly being prescient here, as there is already talk in Vegas and LA of combining their two networks. Same here in DC. The use of TrapWire could eventually extend to fusion centers all around the country as congressional testimony from June 2011 indicates that the Washington D.C. Metropolitan Police Department is part of a trial project of the Department of Homeland Security to test the use of TrapWire. The Texas Department of Public Safety, which operates the Texas Fusion Center, also purchased TrapWire software in 2010. Thanks to Justin Ferguson and others for helping to spread the information in these emails in the face of vigorous attempts to suppress them.